Friend of Rancho Alegre and Los Padres Council, Boy Scouts of America we wanted to update you on the status of Rancho Alegre since the Whittier Fire in July. A dedicated group of Los Padres Council volunteers, the Phoenix Committee, have been meeting weekly since the fire. As you may recall the fire destroyed forty seven of fifty structures in the camp. Since the fire we have completed demolition and removal of debris, both at the main camp and at Larsen Meadows. Working with our insurance provider, we have received $5 million earmarked for Rancho Alegre rebuilding. We continue to work with our insurance company in hopes to receive additional funds. 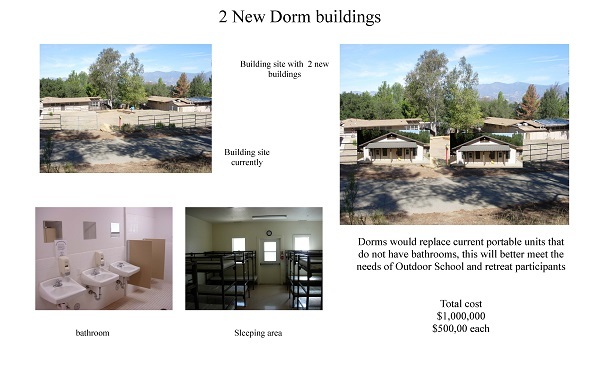 In the meantime, we worked diligently to find a replacement location for our Outdoor School and are not leasing Camp Whittier next to Rancho Alegre for the rest of this school year. The Outdoor School traditionally provided an opportunity for over 4000 fifth and sixth graders to spend a week of science camp at Rancho Alegre. This was the major revenue generator for the Council. We had to turn down more than half the students in the current school year since the camp is not available. We are now set to serve 1,700 students from January to June. Along with finding a temporary site for the outdoor school we were also conducting demolition and water erosion at Rancho Alegre since the fire. Demolition of all damaged structures, equipment and campgrounds, including our historical Clark Ranch House, was completed in December. Various water protection mechanisms were set in place immediately after including k-rails, sand bags, seeding and hay bales to protect the dining hall, pool structure, bridge and roads. During the last storm debris from above our property did make it into Rancho Alegre, but Rancho Alegre only received minor impact to the bridge at Larson Meadow. We had a crew onsite that morning to clear debris and get water flowing on the creek that day. Stantec and S&S Seed have donated services to us that have helped us make the process we have thus far. Many others have contributed to support our efforts as well. Since the fire the Phoenix committee created a request for proposal for development of a master plan and invited local firms to submit proposals. We received a response from three firms. On November 18, the committee met on site at Rancho Alegre to complete our selection of firms for our master plan. RRM and Stantec, both local firms have been brought on to do the infrastructure and rebuilding plan for Rancho Alegre. Stakeholder meeting have been set through the council and a survey will go out to all in efforts to collect ideas on how to improve Rancho Alegre as we rebuild. At the November 18 meeting, the Phoenix Committee also discussed in detail our anticipated capital needs as we rebuild. While we are working with our insurance to maximize our coverage, the committee anticipates a substantial gap will be in the millions to restore the camp into operations. Los Padres Council is committed to keeping the tradition of Rancho Alegre alive for the future of Scouting and community camping. The following list of projects has been identified to maintain the quality of the outdoor experience for both youth and adults. Donor will have a plaque placed at Rancho Alegre recognizing the gift. 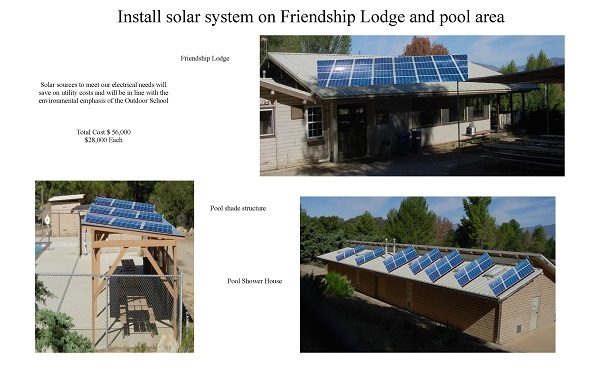 Install Solar System on main structures and pool area. Donor will have a plaque placed at Rancho Alegre recognizing gift. Repave road from Highway 154 entrance gate after construction has been completed. Needed due to heavy equipment damate usage for construction. Roadway will be names on behalf of the donor and a plaque will be placed at Ranco Alegre recognizing the gift. Donor will have a plaque placed at the climbing wall recognizing gift. Dorms would replace burned units that do not have this will meet the needs of Outdoor School and Retreat participants. Dorm will be named on behalf of donor; recognition at opening ceremony; plaque placed at each dorm recognizing gift. Convert Comanche Campsite to a Handicap Accessible Site. Site would allow camp to conform to national BSA requiremeents. Donor will have a plaque placed at campsite recognizing gift. Bathrooms in Rancho Alegre campsites Building of full bathrooms with toilets and showers in order to increase the number of campers activities that can be hosted by camp. $100,000 each Facility will be named on behalf of the donor, recognition at grand opening ceremony, recognition on donor wall and annual report as major donor. Replace chapel and refurbished sitting facility and surrounding area. Structure will be named on behalf of the donor; recognition at opening ceremony; plaque placed to recognize gift. $8,000 for equipment such as canoes, life jackets, paddles, etc. Facility will be named on behalf of the donor; recognition at grand opening ceremony; recognition on donor wall and annual report as major donor. Replacement of Observatory Replace structure and equipment, including telescope $60,000 Observatory will be dedicated to sponsor with plaque and donor will receive recognition in annual report. 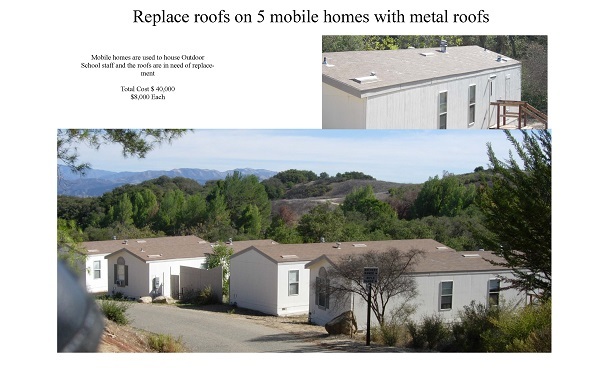 Replace structures and equipment at several campsites throughout Rancho Alegre. Bridge Replacement Replace trail bridges at various areas throughout Rancho Alegre. $3,000 per bridge Selected bridges will be dedicated to sponsor with plaque and donor will receive recognition in annual report..
Procure a replacement tractor Tractor would allow ranger staff to complete many camp and replace a tractor that has significant mechanical problems $35,000 Donor will have a plaque placed at Rancho Alegre recognizing gift. Add a "zipline" element to our COPE Course A professional in this field advised us that this addition would greatly improve the intrest in this program for youth. 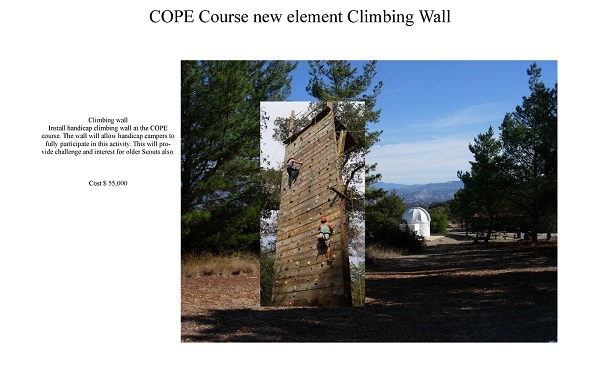 $20,000 Donor will have a plaque at COPE Course recognizing gift. 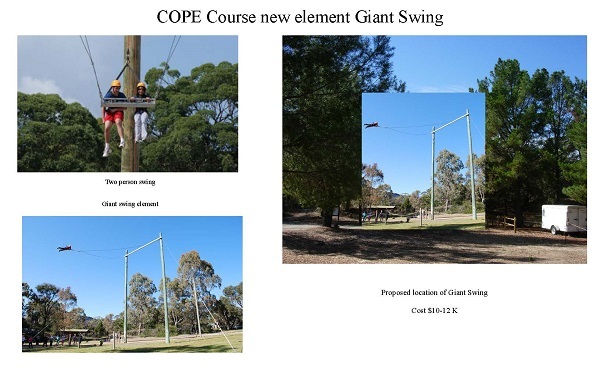 Add a "Giant Swing" element to our COPE Course A professional in this field advised us that this addition would greatly improve the intrest in this program for older Scouts $12,000 Donor will have a plaque at COPE Course recognizing gift. Install continuous chlorine monitor for water treatment plant This monitor would be more efficient than our current system and would automatically alert us to developing problems. $5,500 Donor will have a plaque at Rancho Alegre recognizing gift. Replace Water System This enhancement to our water system would improve our available water for drinking water and fire suppression. $250,000 Donor will have a plaque placed at Rancho Alegre recognizing figt. 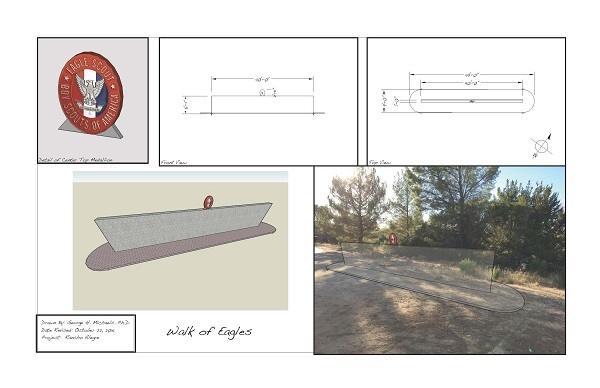 Install and Expand "Walk of Eagles" at Rancho Alegre Project would include the installation of a wall and plaques; continues a long tradition that began at Camp French. $50,000 Donor will have a plaque placed at "Walk of Eagles" recognizing gift. Los Padres Council is committed to keeping the tradition of Rancho Alegre alive for the future of Scouting and community camping. Previously, the following vendors and community organizations have contributed both time and money to make improvements at Rancho Alegre. We thank them for their contribution for their contribution. On behalf of all our youth, we extend our grateful thanks and appreciation!